Everton won the first of their three matches Down Under, thanks to a goal just after half-time by Victor Anichebe. By all accounts this was a very competitive friendly, in which Sydney played their part. Mikel Arteta was reportedly on fine form, while Anichebe looked sharper than he has in ages. And according to Everton’s official website, David Moyes was pleased with the debut of Frenchman Magaye Gueye. 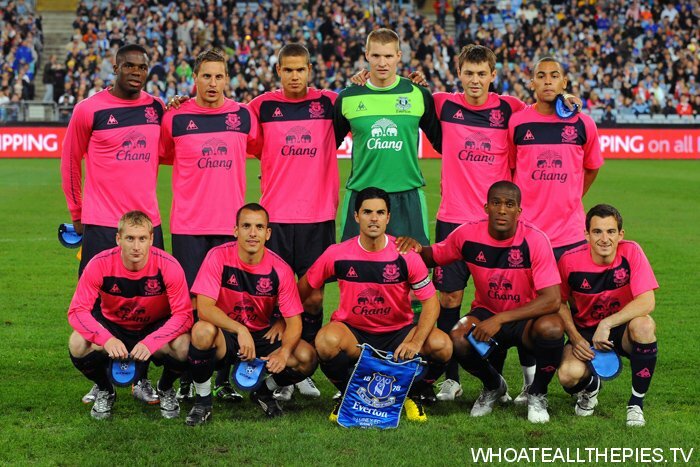 The biggest talking point, of course, is Everton’s shocking, migraine-inducing pink away kit, which is, er, shocking. At least Everton players can’t complain about not being able to see their team-mates. the players name is alex brosque and not greg….